Heist slot machine was developed by Betsoft Gaming, it has a 5x3 reel set and offers 30 paying lines. 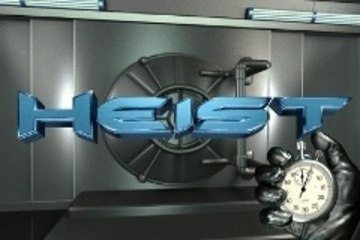 Well-known for having striking characters, Heist is no different from other popular Betsoft games: the main protagonists and symbols are Neil Quailand, a career thief, and Detective Kowalski, his adversary. Other symbols include a bag of diamonds, stacked cash, a gun, bank vault plans, a security system keypad and a stopwatch. There are also special symbols represented by a glass cutter, C4 explosive and vault door. The Heist slot comes with suspenseful bonus features such as the Glass Cutter Bonus, the 2x Wild Reel and the Vault Bonus Round. Three or more glass cutter symbols activate the Glass Cutter bonus round which is actually a pick-me game. It awards the player with free spins or cash prizes. Landing the C4 explosive symbol on the centre position of reel 3 makes it explode and turn the entire reel Wild, amounting in the payout being multiplied 2 times. Perhaps the entire reel will be held for another spin. The Vault Bonus Round is a bit more complex. Landing three or more vault door symbols triggers it, and it starts a mini game where Neil tries to beat the bank’s security system and Detective Kowalski is set to stop him. Through different stages you will chose options that will either make you progress or get caught by Kowalski. Played at maximum bet, Heist offers a top payout of 2,500 credits. The RTP is set at 95.5%. Make sure to watch the entire intro sequence when you first load Heist, as it proves how superb-looking is this Betsoft 3D slot machine. If you would like to play Heist online, as well as other top games, we have listed what we think are the best places to play casino slots in our Vegas Casinos Online page.